This special collection of daily devotions with your Calvary Chapel Pastors will edify you as you read each day of the year. God's Word in these devotions will inspire you, as these Pastors share their hearts and personal experiences of God's faithfulness. As faithful men of the Lord and to God's word, these Pastors have ministered to people throughout the world. 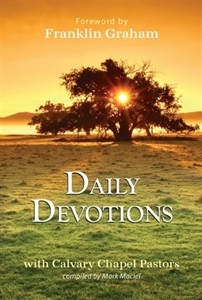 Their passion for the Word is reflected in these daily devotions.